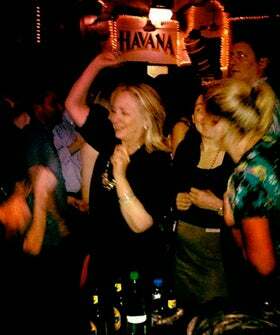 Stop The Presses: Hillary Clinton Parties In A Cuban-Themed Bar! Is it just us or is Hillary Clinton getting sassier by the minute? First, the Secretary of State chimed in on her own web meme, and now the former first lady is getting down and swilling cerveza in Colombia. But wait: On the heels of Marlins' manager Ozzie Guillen and in the midst of the, erm, Secret Service Prostitution scandal, Secretary Clinton deigns to go out to a Cuban-themed bar while in Colombia. What the Miami New Times points out as being the non-scandal of the week, Hillary Clinton went to a club. The Colombian dancehall in question may or may not have been themed after the country ran by He Who Shall Not Be Named, and media outlets are hailing her beer-swilling actions as the next big foreign faux pas.The NY Post points out that Clinton spokesman Philippe Reines won't even comment on her grooving in a bar where "Cuban-themed" music was playing. (He was "in his hotel room, reading", while the revelry was going on. Real cool, Phil.) The Telegraph wonders if "Hillary Clinton (is) becoming an embarrassment as Secretary of State?" And Reuters reports that, when a State Department Official was asked whether "Swillary" (the Post's nickname, not ours) had a good time, they replied, "A lot." Sarcasm aside, if a hard-working powerhouse like Hillary Clinton can't sit back and enjoy a beer, who can? Nothing boosts morale more than having the boss show up for a post-work event, and Secretary Clinton is maintaining her utmost cool. And we all know the prevalence of Havana-themed bars and clubs: In fact, their delicious offerings happen to be some of our favorites.